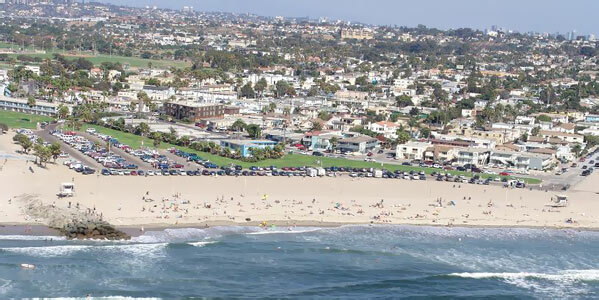 The roots of the San Diego Zoo lie in Ocean Beach, California. That there is even a zoo here at all, world famous or not, is largely due to a chain of events that began in 1913 at the foot of Voltaire Street. On July 4th of that year the doors to the Wonderland Amusement Park were officially opened to the public. In its time Wonderland must have been spectacular. Protected from the sea by high walls with exotic turrets it spanned eight acres of what is now dog beach. More than 20,000 people came on that opening day, roughly one third of San Diego’s entire population, and what they saw dazzled. Wonderland housed a wooden behemoth called the Blue Streak Racer, the biggest rollercoaster on the West Coast. There was a dance pavilion, a sea-water plunge, a water slide, a carousel, thrill rides, fun houses, and at night thousands upon thousands of electric lights and fireworks lit up the skies over Ocean Beach. Streetcars ran every 20 minutes from downtown. Wonderland also had its own zoo with caged lions and bears and primates. Monkeyland, in fact, was home to some 350 of them. But the attraction’s days were numbered. In just two years the Panama-California Exposition would open in Balboa Park and would siphon patrons from Wonderland to the extent that the OB landmark fell into foreclosure. In turn, Wonderland rented their menagerie to the Exposition, where a row of cages was built along Park Blvd to display them along with the beasts that were housed in Balboa Park during the years prior to the Exposition. An animal trainer named G. Kaufman took care of the collection. The Exposition crushed Wonderland. The land was sold at auction in May of 1915. Their menagerie was up for grabs after Expo shut down but city fathers declined and this became the tipping point: a visionary named Harry Wegeforth, recently let go as a city health inspector stepped in and laid the groundwork for what would become the Zoological Society’s permanent home. The now aging Wonderland bears and jackals and lions (and those monkeys) would form the nucleus of the San Diego Zoo when it opened in 1922. Wonderland Park sat deserted for another year or so, its assets having been sold off to other amusement parks. Then, in 1916 a wicked Pacific storm ripped what remained of the property from its footings; high tides would drag Wonderland to a watery grave and the ocean would cover all tracks, much as it did to the temporary camps of the Spaniards who first claimed the beach in the 1700s, or to the shelters of the nomadic Kumaayi who hunted shellfish in tide pools there generations before the Conquistadors ever set sail. A shadowy character named J.M. DePuy made claim during the late 1800s and developed the northern portion of OB where Wonderland was the short-lived anchor tenant. But the first real movers and shakers to come along and see potential in a beach front sometimes called Mussel Flats was an unlikely duo named Frank Higgins and Billy Carlson. William H. Carlson was a Swede; his family immigrated to America in 1870. They settled in San Francisco. Carlson moved to San Diego in 1885 and became editor for a short while of the San Diego Sun. But his eyes were on a bigger prize. In 1886, San Diego’s first real estate boom kicked in and Carlson wanted a piece of it. With a business partner and friend from San Francisco named Frank Higgins, he bought up 600 acres of ocean front property in 1887. They named it Ocean Beach and they sold off parcels of land. They made fistfuls of cash. They built a luxe hotel, and they named it the Cliff House. Higgins and Carlson were at best imitative; consider there was (and is) an Ocean Beach in San Francisco, so named years before Ocean Beach, San Diego came to be. It too had a Cliff House and a turn-of-the-century amusement park: Playland at the Beach. But like Wonderland, the Carlson-Higgins glory days were numbered. The San Diego land boom went bust in 1888, Higgins killed himself in 1889, and the Cliff House burned down in 1898. Higgin’s holdings were taken for back taxes owed; Eastern money bought out Carlson’s remaining shares of OB. Carlson, meanwhile, had a brief reprise: he would go on to become San Diego’s youngest mayor (28) in 1893, but was busted in 1917 for selling phony desert plots. Dark days for Carlson and his former beach town would follow. In 1918, during the spring, riptides sucked at least 60 beach-goers out to sea while they swam and played in the surf off Ocean Beach, killing 13 of them on a single day. This, most historians agree, is why we have lifeguards. George Freeth, born in 1883, was working as a lifeguard on Coronado in 1918 and was called to testify in the matter of the mass drownings. At Ocean Beach, there was no such lifeguard service. Freeth would himself die the next year at the age of 35, a casualty of the influenza outbreak. But he brought something to Ocean Beach that, along with life guards (OB got three of them after the tragedy) would change the way people viewed the ocean: call it surf culture. Freeth was himself a waterman, and he was there when Duke Kahanamoku surfed the waves off OB in 1912. If Wonderland was the start of a world class zoo, then surfing was at the heart of OB’s ever-lasting bohemian culture. That, and geography: the insulation around Ocean Beach has always been its isolation. On a good day in the late 1800s it took two hours to travel the 7.5 miles from downtown by carriage. Cut off by the mouth of the San Diego River from the rest of the mainland, it would be decades before reliable public transportation and roads would access OB. During the 1950s the big money went into the dredging and development of Mission Bay, not OB. This was where resorts and drive-in theaters, housing developments, an arena, and a marine park with trained whales would eventually go. The concrete flowed north of the San Diego River, but OB remained dormant and crumbling, a seedy little town with spectacular ocean views and cheap rents. By the late 1960s and 1970s, college students, ex-military, surfers, bikers, and hippies had made this discovery and Ocean Beach sprouted yet another link to San Francisco: it became a mini-Haight-Ashbury. The air was redolent of pot and patchouli. Tie-dye was the fashion statement and the vibe? Spring break. In 1968, there began an effort to roust hippies and to squelch the general party atmosphere. This led to the OB People’s Rag, which published its very first issue in September, 1970. The Rag would come to reflect OB’s embattled counter-culture. And by 1971, the movement had a voice: the OB Ranger, a program broadcast on HIS FM Stereo 90. The Ranger was a bumbling authority figure whose main purpose in life was to rid OB of illegal goings-on. His arch enemy was Panama Red, a character named after a strain of marijuana that was popular at the time. The show was essentially a spoof based on the real-life police tactics being used to clean up OB. It was voiced and produced by local pop radio veterans Gary Allyn, Neilson Ross, and Lee Mirabal. For two short months in 2010 the rest of the world got to see OB on the tube. Terriers, a TV drama that was not actually about dogs but was instead about cops was filmed in OB. It ran from September to December on FX before the network pulled the plug. Java Joe’s coffee shop was on Bacon Street for a while, and it deserves a mention. Jewell, the famous singer, got her start waitressing at Java Joe’s. She first sang at Joe’s original location in Poway. And while poetic justice (and her hippie VW bus lifestyle) should have put her in OB, it did not. Famous Obceans include John Reis of Rocket from the Crypt fame, and the band Slightly Stoopid, which more or less came to be in the days following a Sublime show at the now-defunct Dreamstreet (Mothers Saloon.) When a bluesman named Tomcat Courtney moved to San Diego, he found work at the Texas Teahouse on Voltaire. There has otherwise been a sense of timelessness about OB that even the old-timers noticed. In 1934, a resident named Winifred Davidson wrote a newspaper series called Ocean Beach of Olden Days. There remain vestiges of the hippie movement of old, although this generation is called travelers. They are train-hoppers with pets that are homeless and sometimes aggressive about getting a handout. Some Obceans consider the punky travelers a part of OB color; others abhor them and their generally underfed dogs. Overall, OB is still populated by mainly Caucasian singles of both sexes. Not a family town: a 2009 survey showed that only 5.8% OBceans were married with children. In 1.426 square miles, the population is 12,419 and the median age is 32. With the exception of the Wonderland Coin Laundry on Abbott, not a trace of the amusement park remains. Inside, on the laundry’s walls hang old historic photos of its namesake. And from the fabled Haight-Ashbury peace-and-love days, both The Black and the OB People’s Food Store are still doing business. They cater to a legion of aging locals from the day who will still take time to argue with a visitor that OB is really just a state of mind. Please go to the original article at SanDiego.com. See other histories of Ocean Beach at our “OB Time Machine“. Great overview of OB history. I put my “O B Ranger” album on the turntable at least once a year, along with the OB songs on the Homegrown series of albums. I was looking for mention of the old OB to Mission Beach bridge where people could fish walk,and drive back and forth between the two places. The fish brought in were awesome! One time I walked across while my father swam from OB to PB. Other times I pulled my wagon to MB to deliver girl scout cookies to the people in the little houses of MB. It was mostly the sailors who were in these houses that would order cookies from me. I sold 200 boxes and got one week of camp at Cuyamaca free! This was a very interesting article – thanks for sharing. I have heard some other stories about the start of the zoo, so I’m not sure what is right now. Also, the comment about this not being a family town – I disagree. OB Elementary, where I attended, celebrated its 100th (!) anniversary a couple of years ago. I had lots of friends here, and there were plenty of families. Look at all the kids along Ebers in the morning. Anyway, it was a really fun read, I learned some things. Newer Article: Did the San Diego Zoo “Euthanize” Two Elephants Prematurely?